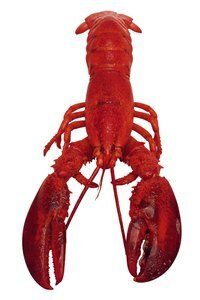 Preparing a lobster before cooking it can make the difference between dining on sweet meat and consuming unappetizing lobster juices and particles. The grain sac or stomach sac of a lobster is located in the head behind the eyes. This sac can contain bones, pieces of shells and digestive fluids. Remove the grain sac of lobsters so guests can concentrate on the succulent taste of the seafood instead of on parts of the crustacean to avoid while eating. Place the lobster right-side up on a cutting board. Spread the lobster flat. Hold the tail down with one hand while holding a chef’s knife in the other hand. Drive the tip of the chef’s knife into the back of the lobster’s head behind the eyes. Move the blade lengthwise down the head to split the head open. Scoop the grain sac out from behind the eyes with a spoon. Rinse the head of the lobster with cold water to remove grain sac remnants.